While the nation identifies with the Super Bowl’s insta-star Left Shark, Katy Perry’s lawyers are apparently more the Right Shark type. They issued a cease and desist letter (see below) to on-demand 3D printing service Shapeways on Tuesday, demanding a 3D model depicting Left Shark be taken down. Shapeways complied, and Fernando Sosa, the designer behind the model, has now posted it on Thingiverse. Unlike on Shapeways, Thingiverse models are free and must be 3D printed by the downloader. 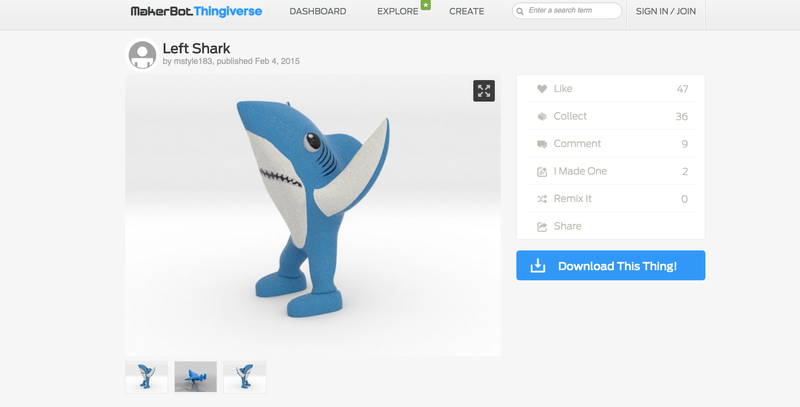 Left Shark, as it appeared Thursday on Thingiverse. It’s a shame because we love our community and always want to be able to support their designs. That’s part of the reason why our work with Hasbro is so fun! It’s allowing fans to create products truly inspired by the things they personally enjoy. We know these things can happen when you have a lot of user-generated content, but hopefully more brands (and celebrities!) will take note and want to work together with fans to create amazing products! NYU law professor Christopher Sprigman tweeted that he believes Left Shark is not copyrightable because it qualifies as a “useful article,” which would mean it is not protected the same way as an artistic work. Both Thingiverse and Shapeways are home to scores of ostensibly copyrighted models, including memes. While it’s hard to say who has the rights to sad Keanu or doge, Pokemon figurines are a little more black and white. Both sites have received takedown requests in the past, but designs tend to stay up until a letter arrives. The Joseph Ducreux, AKA “Disregard females, acquire currency”, meme, 3D printed by Shapeways. IP law finds itself in an unchartered space with the rise of 3D printing, though new models are beginning to emerge. Shapeways has entered into partnerships with a few companies like Hasbro that allow anyone to model their characters, and then funnel some of the sale proceeds back to the copyright holder. If you absolutely must get your hands on a 3D printed Left Shark, Sosa is urging people to download it from Thingiverse before the site receives a similar letter. Left Shark rose to fame during the Super Bowl halftime show Sunday. Katy Perry sang “Teenage Dream” among dancing beach balls, trees and two sharks. While Right Shark had the dance down, Left Shark had to improvise a bit. But that didn’t stop him from dancing with everything his little shark heart had to give. 3D print like lawyers aren’t watching, dance like Left Shark. This story was updated at 2:15 p.m. PT with more details on copyright and Left Shark. It may be new technology but the concept of making a copy in a different medium is hardly uncharted territory. E.g. famous artist Jeff Koons was sued by a photographer named Rogers, when Koons used Rogers’ photo without permission to create a sculpture called String of Puppies. Rogers won. That’s just one example. A judge blind enough not to see that might also be the kind that ignored hacking, identity theft, and viruses when they were new, not really a good plan. Whether the shark is copyrightable remains to be seen, but I’m sure Perry’s lawyers are reading the info on where else it’s being put up for sale. The site hosts don’t really get to choose whether to remove it, as they must remove infringements or assume liability for it, (Digital Millennium Copyright Act). I suggest googling ‘copyright myths’ to find out more. I missed the shark act, so not even sure why this thing got so popular! I would love to see the Hanna-Barbera Production Lawyers go after Katy Perry…. I actually think that anyone trying to make money off of someone else’s idea should be prosecuted. People giving it away for free is a different story. The Shark costumes they used are in style and colors barely different from generic, royalty free cartoon shark designs you can find anywhere on the net. Trying to claim they are copyrightable is laughable. Agreed @ JamesT. My point exactly. It brings her more recognition at the end of the day anyway. What they have done is going to backfire on them. Typical big fat cat corporations can’t let the guys have a little fun with their new toys so they do the get back at you think with a cease and desist letter. I can’t see how they can actually enforce it as once its created from something else it becomes a new creation. He should sue them! I like that it’s up on ThingVerse now. If her PR/marketing team is smart and can defeat her cabal of lawyers, she’ll say that she’s happy that her fans can print them for themselves instead of a 3rd party trying to profit off her attempt to entertain the world. Take down a file already posted to and downloaded from the internet. Lol, good luck with that. I can’t stand it when an entity holds the rights to something profitable (something the masses want), but have no idea how to monetize it themselves. So instead of coming up with the costumes, figurines, mugs, whatever people are actually clamoring for, they just make sure they stop everyone else from profiting. I think I made a left shark likeness, I hurried and flush it, too bad the lawyers don’t fit. Lawyers are little more than glorified letter writers. As if Katy Perry or her lawyers invented a “shark”. Get real. Nooo, the Right Shark just doesn’t have the same vibe as Left Shark. People will know your lie!